When people see the display the first time, Bruce – a Shore Acres resident and father of 3 Daughters Brewing owner Mike Harting – says the reactions are “amazed” and “enjoyment.” Asked who is more excited, the kids or the adults, Bruce doesn’t hesitate when responding: the adults. Since the brewery is a family-friendly environment, kids are as welcome to visit as adults to see the display, which stays up through early January. 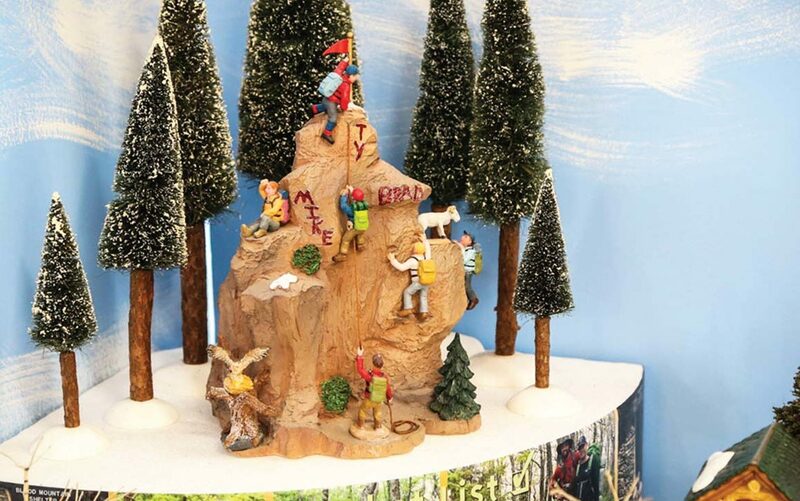 Bruce’s daughter-in-law, Leigh, points out that Bruce has handcrafted many of the pieces, like the figurines of people hiking up a mountain. She says that every year Mike, 3 Daughters head brewer Ty Weaver, and logistics manager Brad Rice and his wife hike a portion of the Appalachian Trail. Bruce made the figurines to recognize their accomplishment. Setting the display up is “a family thing,” and Bruce says that all of his grandkids help out. His wife Pat is in charge of organizing the Christmas Village people – all 442 of them. After dusting each one off, she arranges them in the village. If children are in the brewery while she’s working, she lets them place a piece wherever they want. One year, a little girl wanted to put a figure on top of the motor that controls the tiny parachutists. That is exactly where the figure went and stayed. The tradition of the display has family ties, too. The collection began in 1986. That year, Bruce’s mother gave the family their first Department 56 piece. Every year since then, the collection has grown. At first, it was placed around the Harting family’s Christmas tree, then when it got too big, it went on display in the garage. 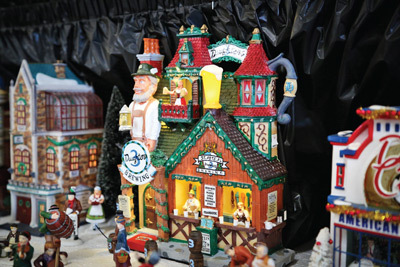 When Bruce’s son, Mike, opened 3 Daughters with Ty Weaver five years ago, the Christmas Village came to the brewery. When the season is over, the Christmas Village is stored at the brewery, and from January to November it is kept carefully wrapped in plastic among the kegs and cans in the back of brewery. When the display is taken down in January, pieces that need to be fixed are added to a list and marked with a piece of blue tape. Over the summer, they fix the broken items, ensure the lights work, and check all 88 mechanized pieces. On top of this routine maintenance, every year three tables are gutted, redesigned, and rebuilt. 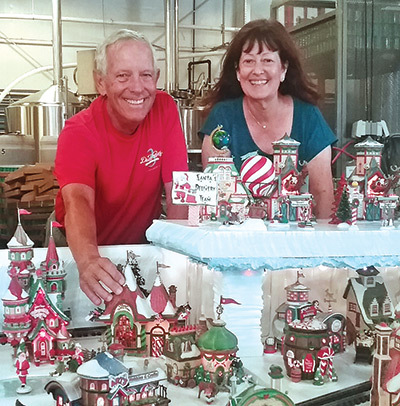 Creating and maintaining the Christmas Village is Bruce’s way of bringing a bit of the Christmas spirit to St. Petersburg. 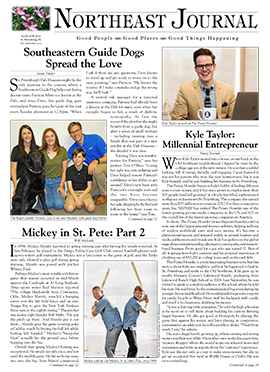 “In Florida, it’s kind of hard to generate that interest,” Bruce explained. Adding that there is no snow or cold weather, he says “its hard to get wrapped into Christmas.” The Christmas Village is a fun way to fix that.